Arizona Center is the heartbeat of downtown Phoenix. It’s where entertainment, shopping, live music and events, casual dining, and prime work spaces create a unique, centralized hub for all who want to join in on the excitement of downtown. Arizona Center has a wide selection of restaurants for breakfast, lunch, and dinner. From Southwestern cuisine at Canyon Café to breakfast and coffee on the go at Starbucks, whatever time of day and whatever your taste, Arizona Center will curb your cravings. The refreshing waterways and greenspace at Arizona Center create the ultimate urban oasis for relaxing and unwinding. Take in the tranquility as you stroll through the lush garden grotto and enjoy the courtyard shops and galleries. Host an affair to remember, personal or corporate, by utilizing our unique and centrally located outdoor amenities capable of accommodating groups of almost any size. Restaurants, retail, events and more, you can make Arizona Center your own. 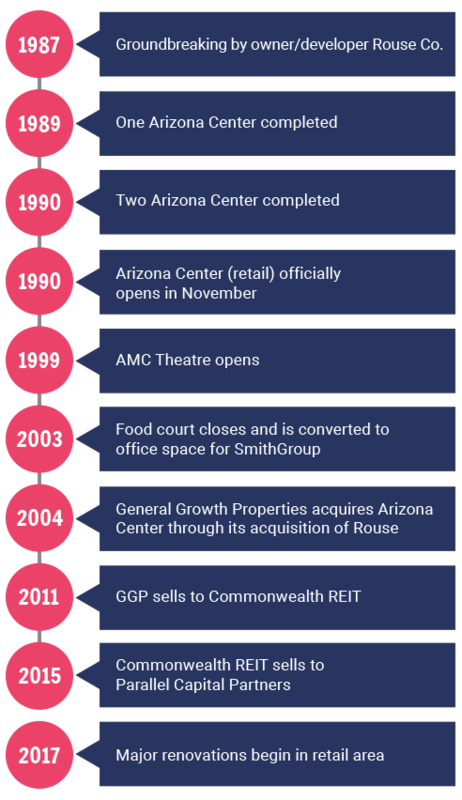 Arizona Center was constructed by mall developer Rouse Co. in 1990 to jump-start the economy and redevelopment of Downtown Phoenix. The property was designed as the first mixed-use project in downtown Phoenix and was key to the revitalization of the area. With the relocation of the Phoenix Suns in 1992 and the $32 million renovation of the Convention Center in 1995, the city of Phoenix was integral in the Arizona Center’s early success. In 1999, AMC Theatre was added to the property, and coupled with Arizona’s first Major League Baseball team, there was a resurgence of interest in downtown Phoenix—and the Arizona Center. During the next decade, Arizona Center faced what many multi-use projects faced during the economic downturn—closing stores and difficulties in leasing office space. With a newfound vision and determination to build a thriving center, the property was purchased by a joint venture between San Diego based Parallel Capital Partners, Inc. (PCPI) and New York based Angelo Gordon in December of 2015. The ownership is poised to create a new and exciting environment for downtown residents, employees and visitors, especially with the growing presence in downtown Phoenix of Arizona State University and the University of Arizona. With a capital infusion of $25 million, PCPI will look to make substantial improvements to bring Arizona Center to its original glory. 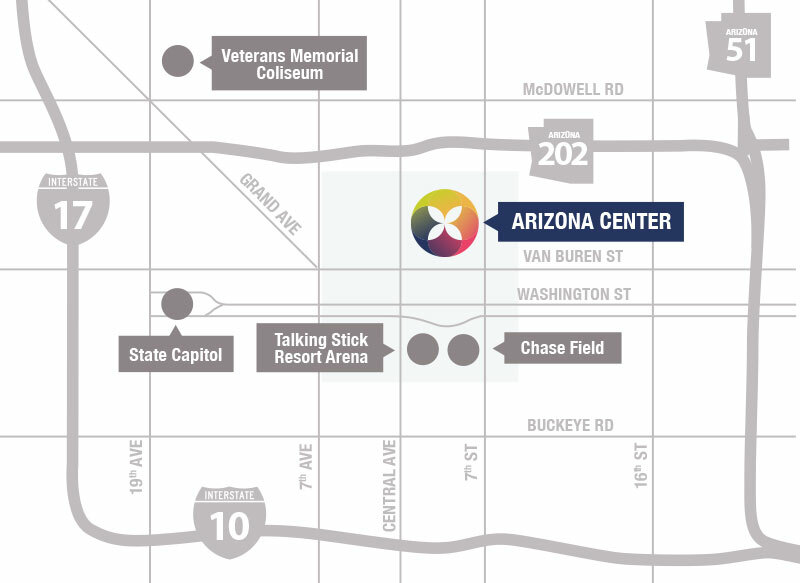 Arizona Center is owned and managed by Parallel Capital Partners, LP.